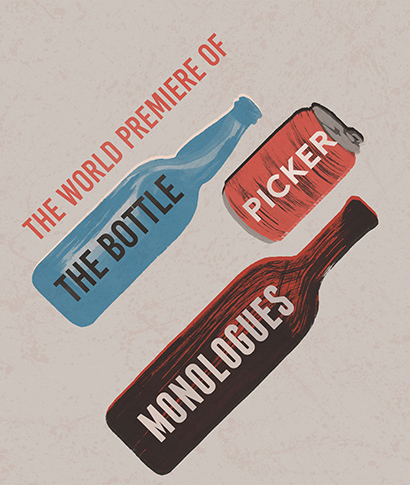 Join us for a theatrical event created by current and past bottle pickers that gives insight into their diverse experiences. From “The Bottle Picker Monologues”. Pictured: Greg Lang. Cart design by Lane Shordee. Photo by Diane & Mike Photography. Pictured: Kim Brown & Matt McKinney. Cart design by Lane Shordee. Photo by Diane & Mike Photography. Pictured: Nigel Kirk. Cart design by Lane Shordee. Photo by Diane & Mike Photography. Pictured: Greg Lang, Kim Brown, Nigel Kirk and Brady Ackroyd. Cart design by Lane Shordee. Photo by Diane & Mike Photography. Our overall goal is to use the skills of theatre to increase empathy and reduce stigma towards bottle pickers. Everyone deserves to feel safe. 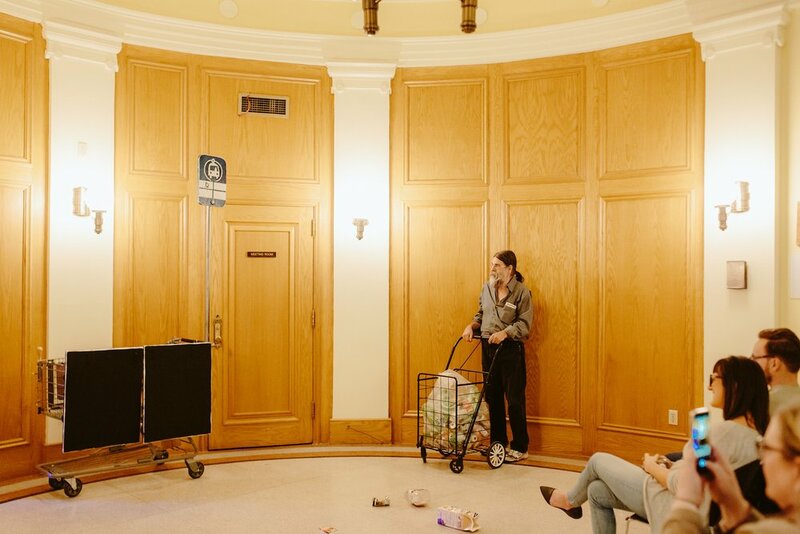 This project is created, designed and performed by Calgarians with current and past experience bottle picking, with mentorship from professional artists. Want to join us? Learn more below! Set design & construction: Lane Shordee. Contributors: Maryam Dashti, Anna Johnson, Amberle Kalhavy, Jessi Letizia, Kate Letizia, Jamie Lynem, Darren Mycroft, Constable Devon Oullette, Randy Pages, Kwanita Roy, Kathryn Smith, Rick Vigrass as well as Virginia, Blaze, Scott, Darcy, Kevin and pickers who chose to remain anonymous. 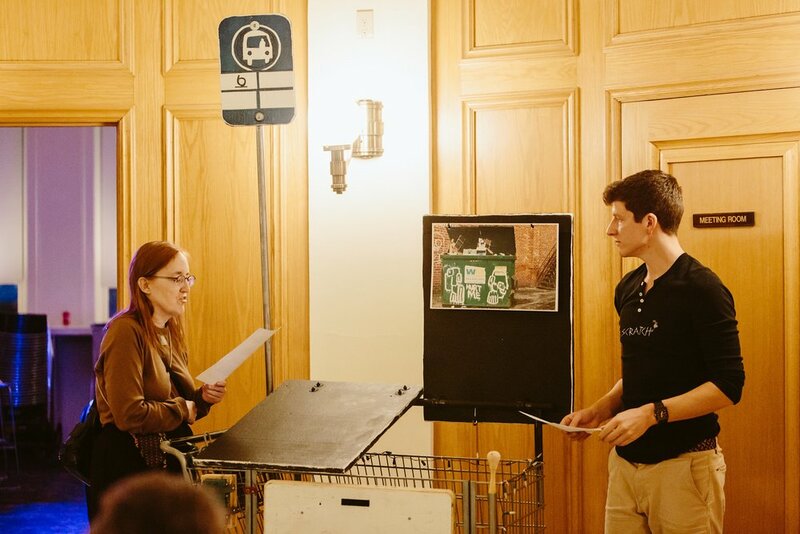 A 15-minute "pop up" version of The Bottle Picker Monologues was performed November 25, 2017 for the PWYC lineup of Theatre Calgary's A Christmas Carol and November 27, 2017 at Arts Commons' Happenings. The contributing artists were Kim Brown, Ellen Close, Maryam Dashti, Anna Johnson, Amberle Kalhavy, Nigel Kirk, Greg Lang, Jessi Letizia, Kate Letizia, Jamie Lynem, Matt McKinney, Darren Mycroft, Jessie Paynter, Kwanita Roy, Lara Schmitz, Kathryn Smith and Rick Vigrass. DOWNSTAGE is a professional theatre company based out of Arts Commons. We produce Canadian theatre, usually new plays by local artists, that explore big questions and social issues. We're now doing more "co-creation" with community members who may not consider themselves to be theatre artists. 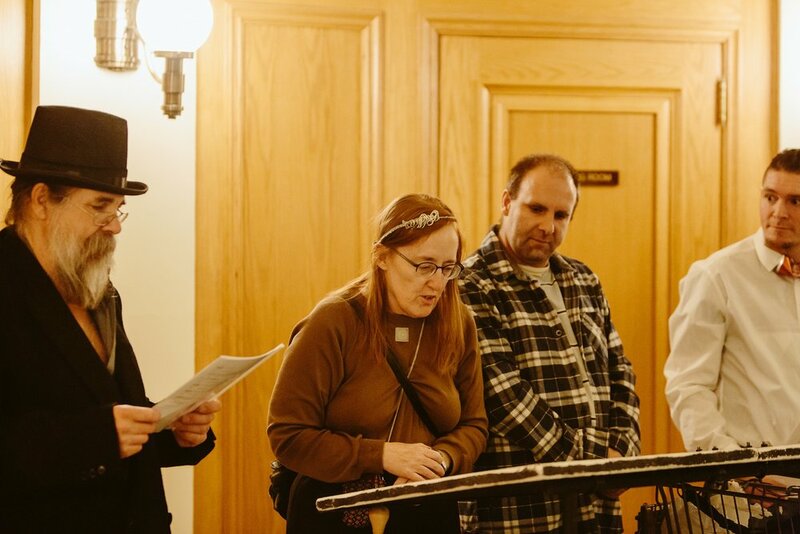 CALGARY CAN is a group of Calgarians who are dedicated to reducing waste and improving recycling opportunities in Calgary by collaborating with the bottle picking community. Their vision is that bottle pickers are valued and compensated for their environmental and economic contributions; and their mission is to create a community-driven enterprise that involves and employs bottle pickers on their own terms.